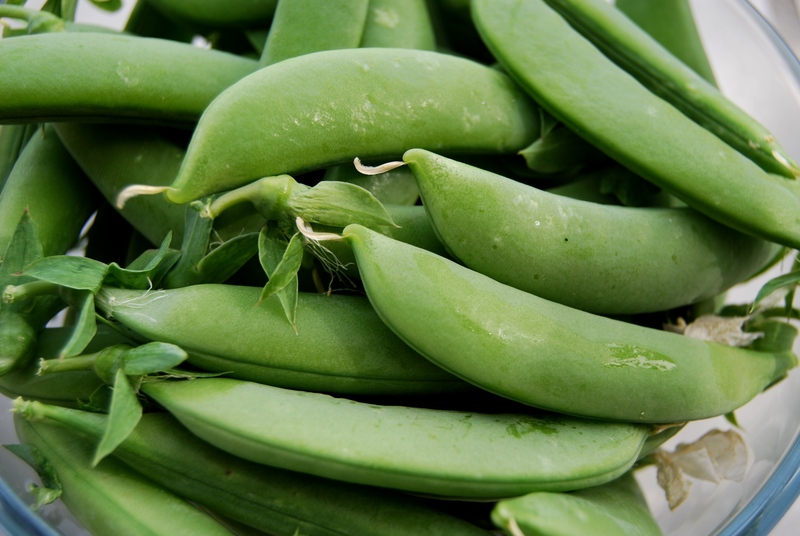 Each summer I start off eating the new pea pods thinking there will never be enough, soon it’s time for succulent stir fries with mushrooms and chicken then before I know it there are snow peas everywhere and I don’t know what to do with them. Last year I tried pickling them and they are absolutely delicious! They are great as is on a relish tray or add a nice zest to salads. If you have never canned and are gearing up to start this year or if it’s been a while it’s a good idea to get up to speed on safety issues. This site from the University of Georgia is very comprehensive. If you have just a few pods, a lot of pickle eaters and space in your fridge then making refrigerator pickles is a good way to go. These have a brighter color and flavor but must be kept in the fridge as the water bath canning is not done. 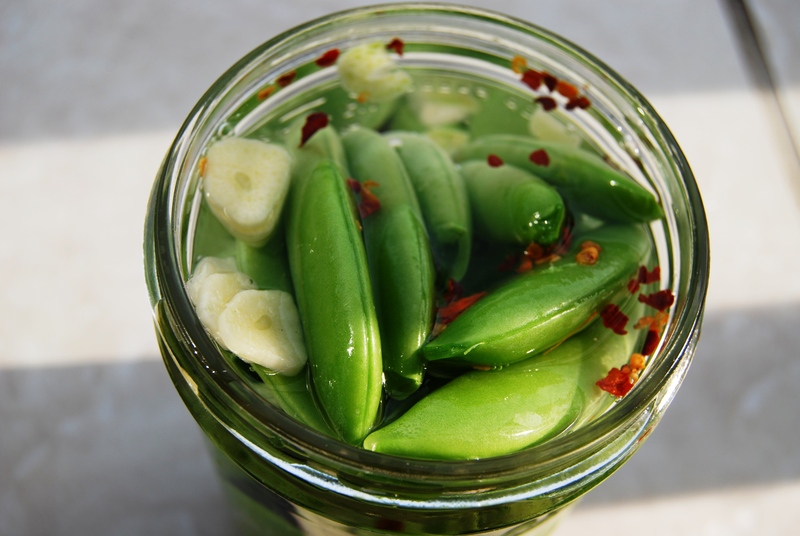 If you have limited space or a ton of produce then most dilly bean recipes work well for pickled peas. 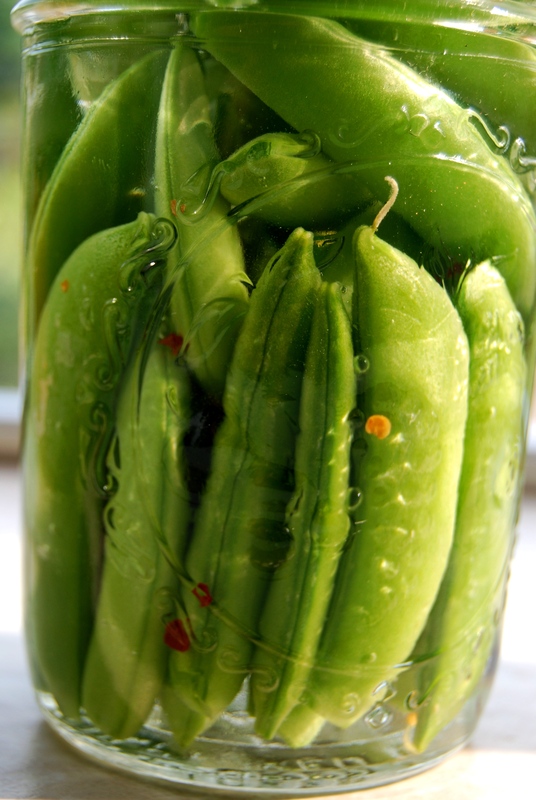 Be sure to follow the recipe exactly as peas are a low acid food and must have vinegar added if they are being water bath canned. 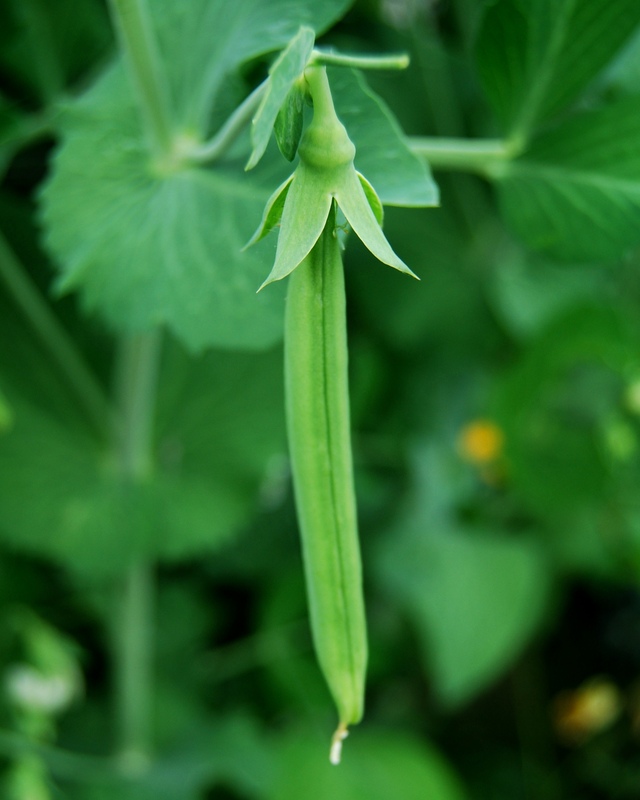 Pick and wash peas then strip off strings. Pack into jars leaving a half inch of head space at the top. Sterilize your jars while you prepare the rest of your ingredients. Combine vinegar, water and salt in a medium saucepan and bring to a boil. 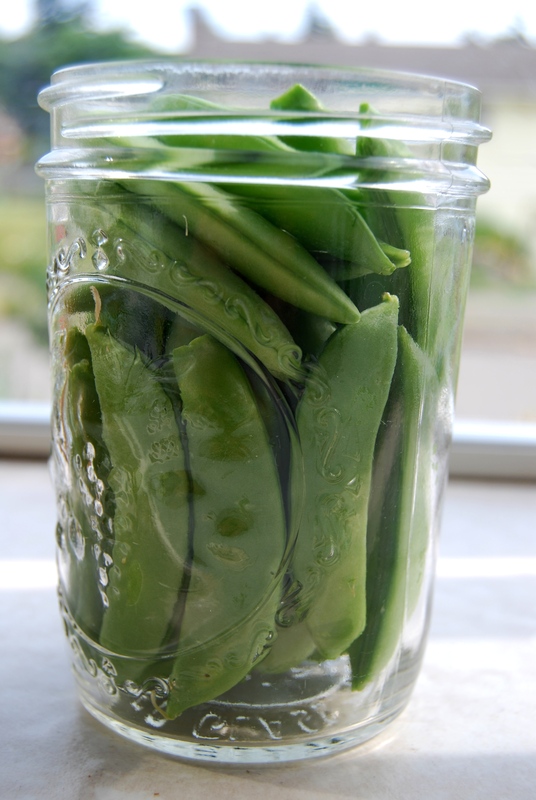 Pack your pea pods into the jars, leaving 1/2 inch headspace (distance between the tops of the beans and the rim of the jar). 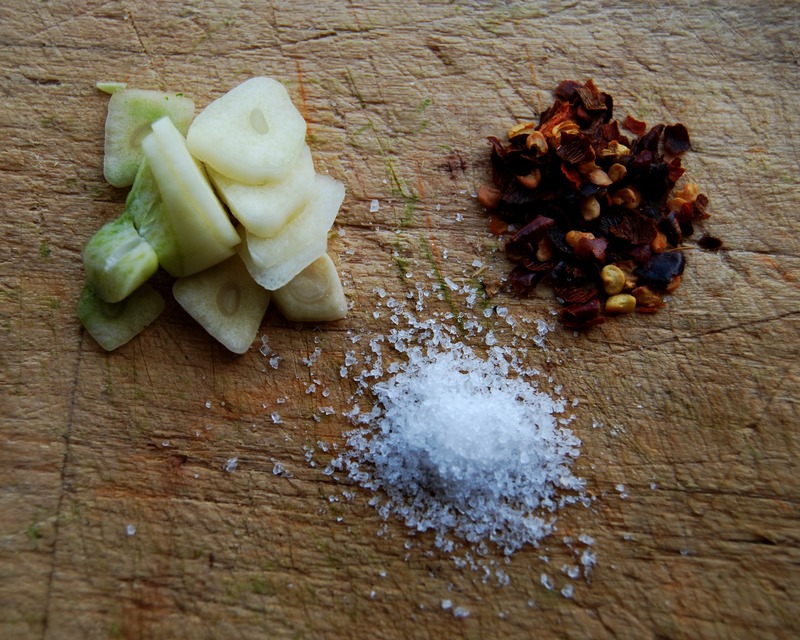 To each jar, add 1/4 to 1/2 teaspoon cayenne pepper, 1 clove of garlic and 1 teaspoon pickling spice. Garlic, salt and hot pepper are what I like to use. Sometimes I add sugar and other spices too. Pour the boiling brine over the beans, wipe the rims and apply the lids and rings. Process for 5 minutes in a boiling water bath (start timing when the pot has come to a roiling boil). Here are the peas with the brine solution. They need to be well packed or will float up. All the peas must be covered by the solution. These can be put in the fridge and eaten in a week or water bath canned for later.